It’s still Wednesday, so this comic is technically NOT LATE! Maybe a bit delayed, but not late. Anyhoo, I think Scout might be a little loopy with hunger right now, otherwise why would he risk approaching strangers? 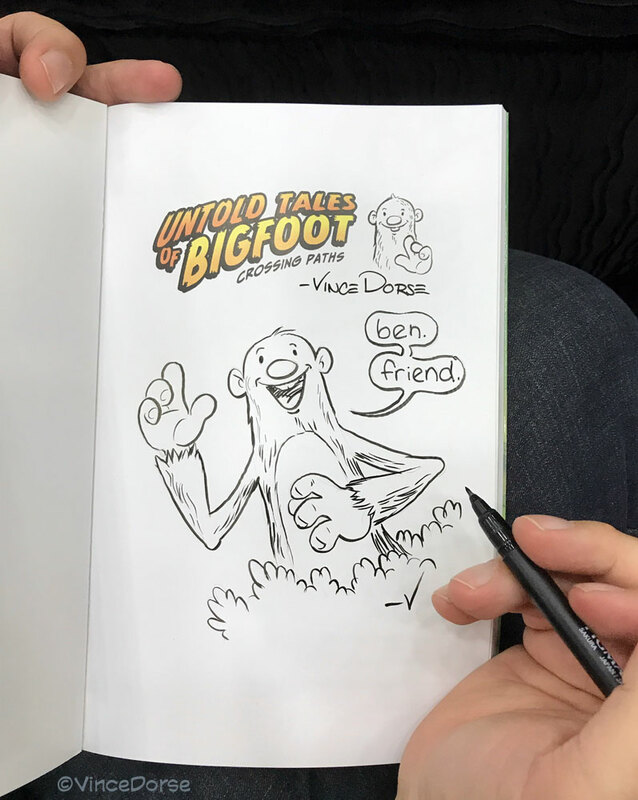 I think Bigfoot might agree with me. Guess we’ll see how it turns out and hope for the best. This is one of the iterations of my con table, which went through many reconfigurations until I felt we got it right. 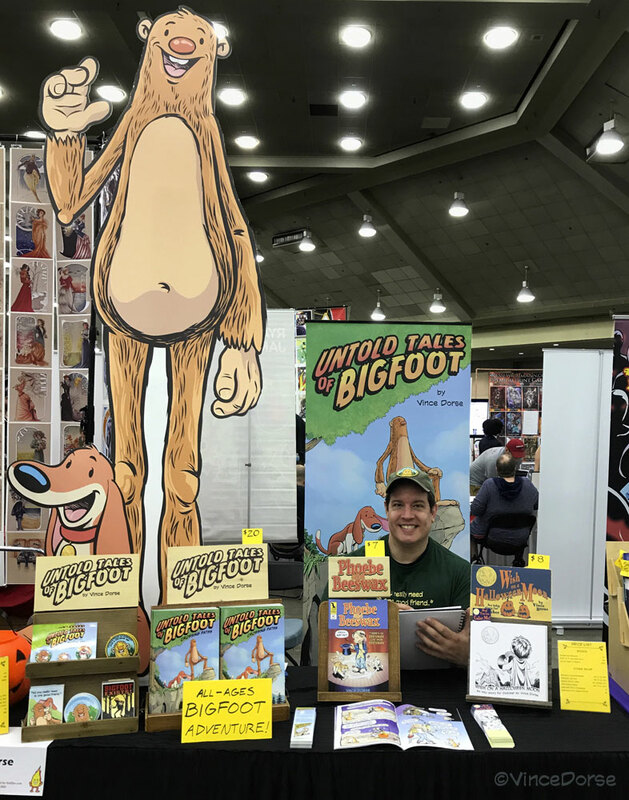 Bringing Bigfoot and Scout up front helped people notice us (mostly because the table was kind of overshadowed by some very tall print racks to one side). In fact…. 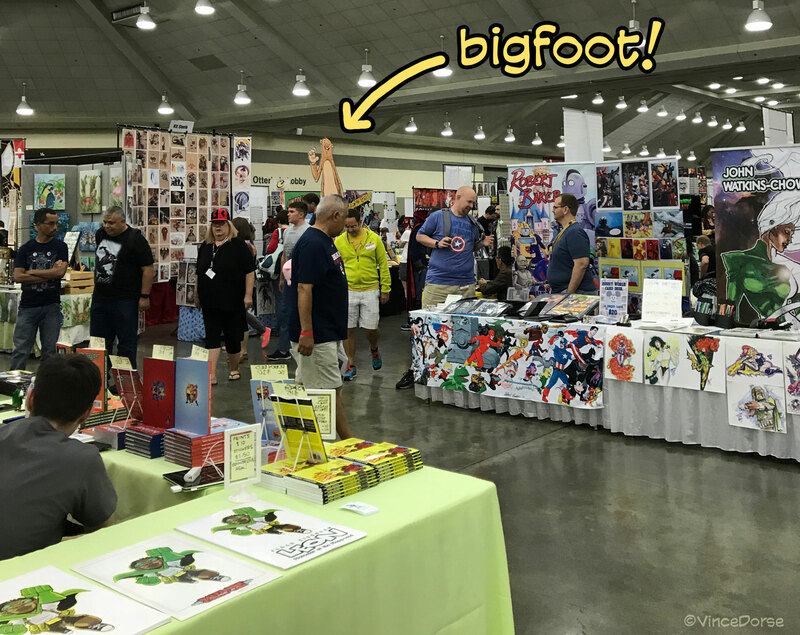 …you could really spot the big guy from across the convention floor. A dad got the book for his son, Ben, and when I told him the name of the kid in the book was also Ben, he was super-thrilled. So was I, actually. This was my first “Ben” signing. Hoping for a “Zeke” sometime soon. Some of the cosplayers that walked by my table? Captain Kirk and his Gorn-friend. Complete with Star-Trek-infused-schtick. 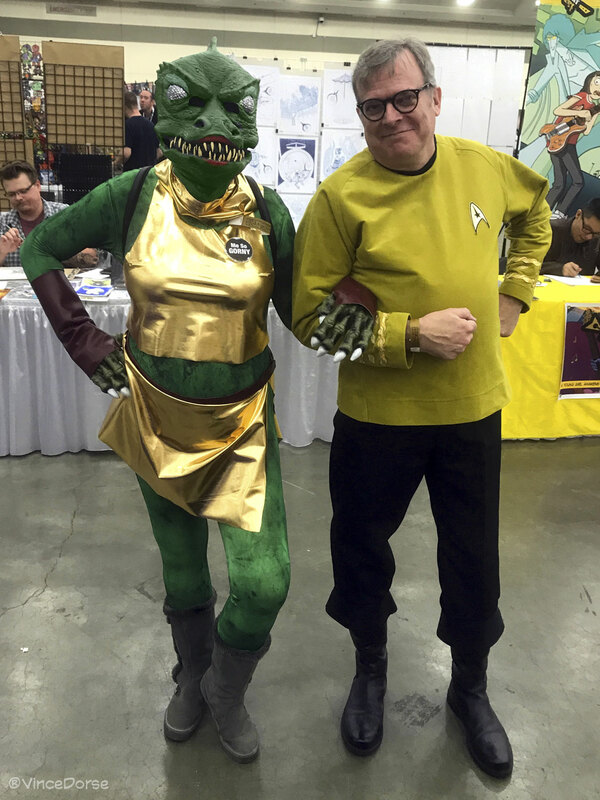 A really funny couple (despite the fact that when the Gorn tried to talk through that mask, it sounded like someone speaking with a pair of socks stuffed in the maw). 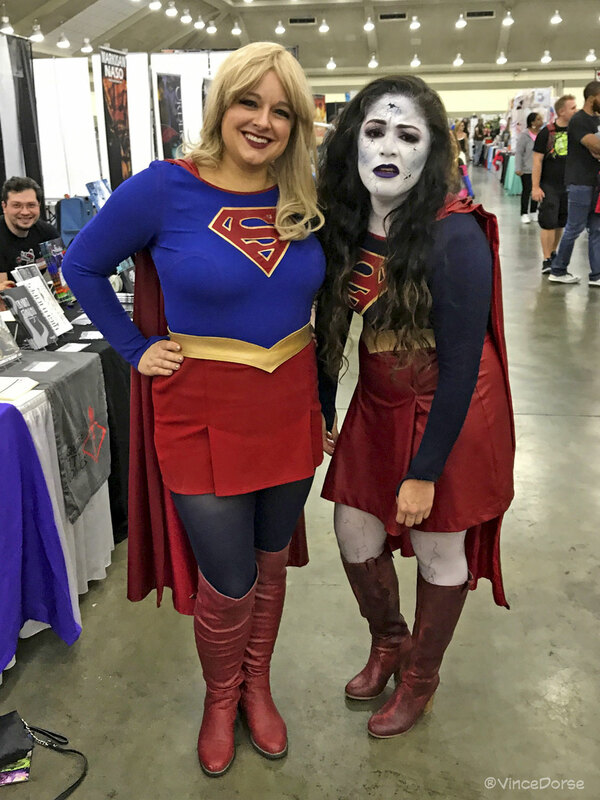 Supergirl and Bizarro Supergirl. They really had fun with it, striking this hilarious pose right before we snapped the photo. 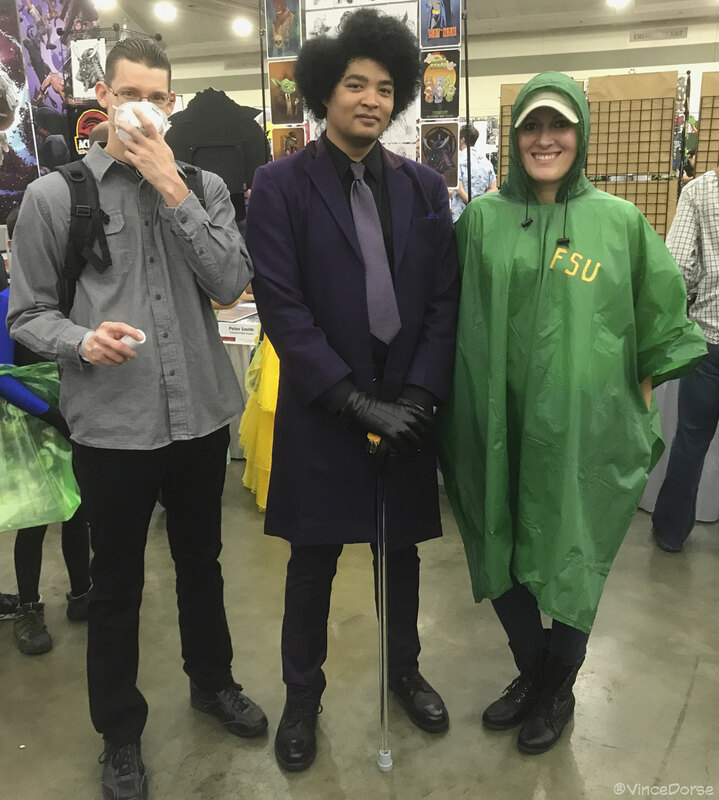 These three walked by just an hour or so after I commented that nobody EVER cosplays as the characters from UNBREAKABLE. Well. They showed me. Mister Glass even has his trademark cane! 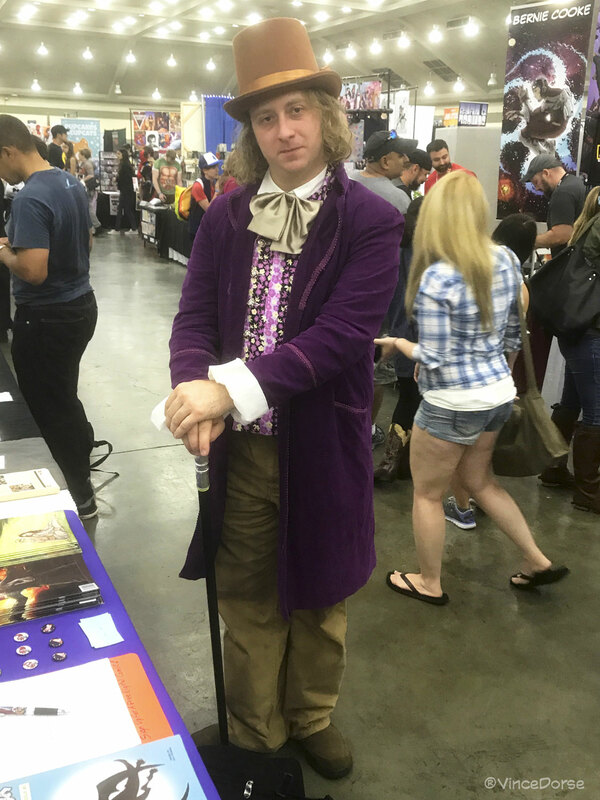 This Willy Wonka was my favorite, though. He talked like Wonka, walked like Wonka, acted like Wonka…he even gave out candy. If he’d done the fall-into-somersault move from the movie, I’d have fallen over dead. 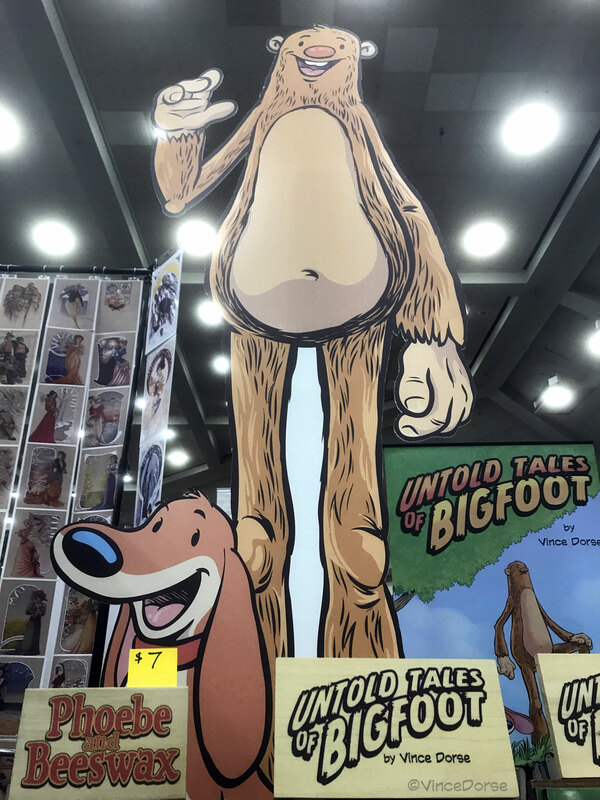 Here’s another shot of Bigfoot and Scout watching over my table and greeting visitors. 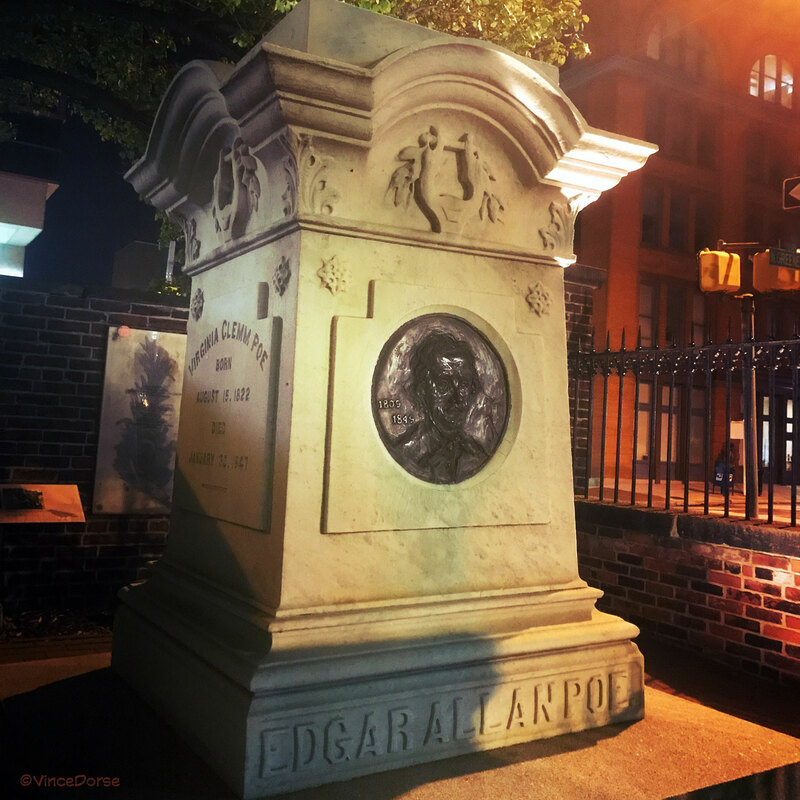 And, of course, a trip to Baltimore wouldn’t be complete without a visit to Edgar Allan Poe’s grave. It was just a 12-minute walk from our hotel, and we did it at night. Ended up being the only ones there, creeping through the slightly open gate, around the shadowy headstones — thinking about Poe stories and people being buried alive — when a security guard snuck up on us and we nearly died from fright. Well worth it, and a nice tribute to a guy whose stories scared me plenty when I was a kid. I hope you have something in mind before you just let that little dog step out there. This is getting more intriguing each week! Thanks for making the effort, Vince, we love it! That’s got to be the biggest cut out I have ever seen. So cool..! love the Unbreakable cosplays. How did the Phoebe ‘mini comic’ do? I honestly had never seen an Unbreakable Cosplay until that moment. I really liked it. And now I have to watch that movie again.